Hi there! Today I’m sharing a review for a M/M contemporary romance from Ralph Josiah Bardsley. 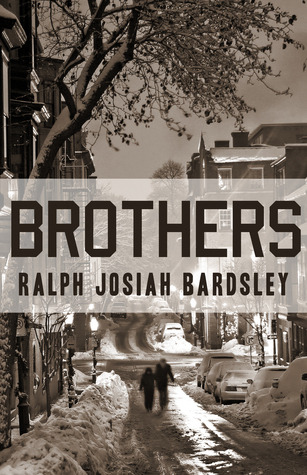 BROTHERS looks at two Irish families in the Southie area of Boston, one is a man raising his younger brother since their parents were killed, and the other is the youngest of four reconnecting with his older brother returning from war. It’s a real study in family, and how to negotiate an openly gay life. I liked it. At twenty-three, Jamus Cork’s plans are simple—graduate college, stay in New York City, and write. But those plans change when his parents are suddenly killed and he finds himself the guardian of his little brother, Nick. Jamus ends up back in the Boston neighborhood where he grew up, with a crying toddler on his knee and the challenge of building a new life for himself and the boy. Jamus somehow finds a way to navigate the ups and downs of single parenting, but over a decade of raising Nick, Jamus never truly overcomes his struggles with loneliness and the guilt he feels as the sole survivor of the crash that killed his parents. That changes when he meets bookishly handsome Sean Malloy. There’s a spark between the two men, but both must face down their own private demons to find love in the Irish enclave of South Boston. This is a family M/M novel that involves two separate families in modern Boston. There are real struggles, and no steam. The bulk of this story occurs in 2009. Jamus is nearing his grad school graduation when he’s in a car wreck that kills his parents and leaves him as custodian of his 3 y/o brother, Nick. He’s not a parent, and he’s not a brother. As their life moves on, he accepts the parental role grudgingly. The book mostly centers around the time when Jamus is 35, and a successful author in his own right, caring for Nick who is now 14 y/o. In the time he’s cared for Nick Jamus has had no social life, and only occasional one-night stands when Nick was old enough for sleepovers. He poured his heartache of loss into his novels which are LGBTQ stories–and is an out-gay man in the South End neighborhood of Boston. Sean is the youngest of four kids in Southie. He’s 26 and just graduated with a PhD in education. He takes a low-pay teaching job (not sure why this is his best option–I have a PhD and teaching paid pretty well even with my limited experience) at a private school in Cambridge. The same school where Jamus’ brother Nick is a freshman; and in his English Lit class. Sean is being hounded by his family to settle down with a girl–which was also perplexing, as his two elder sisters who must have been nearing thirty were neither settled nor dating anyone of relevance and his elder brother Kevin is not facing this same scrutiny. Kevin is a rock–back from two tours in the Middle East and recovering from mild PTSD. There is a woman, Grace, who is adored by the family and who has plain attraction to Sean, but Sean is not interested. He’s not sure why, mainly, and doesn’t figure out until 65% through the book, when he meets and interacts with Jamus, that he might could be gay. This is a really interesting story of family dynamics, coming out, and self-sacrifice, but suffered in the romance department. There is absolutely no steam, and I was not convinced that there was much of an attraction. It’s entirely possible that book-loving Sean was enamored of Jamus’ status as a successful author and intrigued by his first gay experiences, but not really a good match. There is a big falling out, both with Jamus and Nick–regarding backlash at the high school, and Jamus’ role in the wreck that killed their parents. The catharsis of his fiction leads Jamus into trouble with Nick, and the homophobia surrounding Nick’s guardian is absolutely horribly managed in the high school. Considering the expense of private schooling in New England, I was stunned that there was so little remedy to Nick being bullied. Sean is outed against his will, and it leads to strife that is not managed on the page. Young Sean runs to a safe harbor, and we only get snippets of there being any resolution to that problem. The romance between Jamus and Sean is tentative and even when it is not it’s subdued. I wanted to see some heat between these guys. Alas, no. Sadly, I guess we only get to see their frailties bared on the page. Interested? You can find BROTHERS on Goodreads, Amazon and Barnes & Noble. I received a review copy of this book via NetGalley. Ralph Josiah Bardsley was born in a small town outside of Boston. His father was in the Coast Guard and he grew up in a lot of different places – New Orleans, Cape Cod, North Carolina and Sitka, Alaska. When he wasn’t in school, he spent most of his time in Coast Guard hangers or reading. Today he lives in San Francisco with his husband Dana. Ralph’s hobbies include writing, running and wine tasting! Ralph works in the high tech industry in marketing. He holds a bachelor’s degree from Greensboro College and a master’s in communication from Emerson College. You can catch up with Ralph online on Goodreads.